If you’re set on bringing home your very own Bull Terrier, you’ll definitely want to take a look at our fantastic and comprehensive Bull Terrier Names list. If you’re looking for some good names for Bull Terriers, this article will suggest 200 cool, cute, and unique Bull Terrier names! Deciding on a name for any new pet is a wonderful start to bonding with your new furry friend. Often, prospective pet parents see their pet and quickly think of a name inspired by their unique appearance and personality. Other times, a name will come to mind that, quite simply, just fits. That being said, there is the chance that you might run into a pet-naming block. This is a big hurdle. Once you pick a name for your new pet, it is very important that you stick with it. This will minimize confusion for your new pet. If the second paragraph describes you, not to worry. 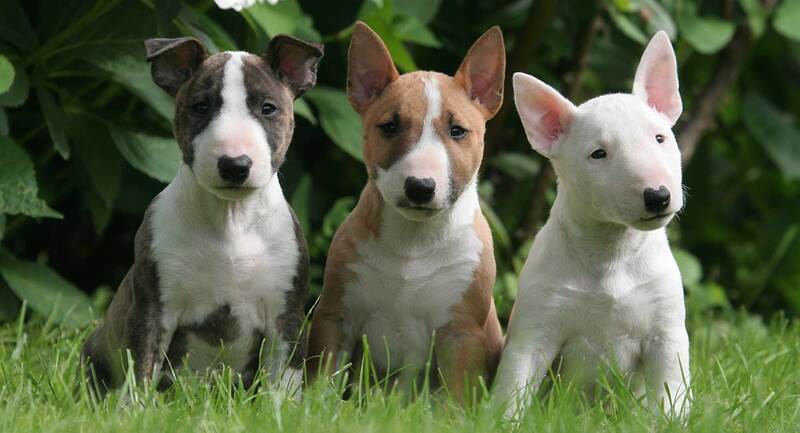 Fortunately, the Bull Terrier is a very distinctive breed, both in terms of appearance and temperament. Now, let’s take a quick look at the Bull Terrier dog breed, particularly the characteristics that are most helpful to naming. You likely already know that the Bull Terrier is a unique breed, to say the least. Most obvious is their appearance, as a quick online image search will show. They have what is commonly referred to as an “egg-shaped” head with small eyes. Their body is compact and muscular. Their short-haired coat can be white or several other colors, often with markings. The Bull Terrier’s distinctiveness does not stop with their appearance. These dogs are generally energetic and strong, and have a personality that gives them an added twist. Clearly, this breed is unapologetically unique! Naming pets based on appearance, personality and original heritage is a common practice, and for good reason. The Bull Terrier is undeniably distinct from other dog breeds, and these unique traits can lead us to many potential names. For this and the next section on male names for Bull Terriers, we will focus on names that reflect their British origin. Many of these names have roots in Old English and Middle English. In general, they evoke the image of their mid-nineteenth century career as a young gentleman’s companion dog. Some of these names will likely seem familiar, while others will look (and sound) a bit more foreign, even antiquated. Now, let’s look at our female Bull Terrier names! For more female dog names, take a look at our article on female dog names. Continuing our name ideas based on the Bull Terrier’s British background, here are our male Bull Terrier names. Again, you will probably see some familiar names, along with many other unfamiliar (but still very appealing) names. Most of these names have an unmistakably distinguished sound and feel to them. If you want even more ideas for male dog names, check out our article on male dog names. For this list, we will take our cue largely from characteristics such as the Bull Terrier’s aforementioned strength and speed. The resulting list is a combination of English-origin and popular, evergreen dog names that stand out as having a “cool” meaning or sound (often both)! Let’s get to it with our cool Bull Terrier names. Looking for more cool dog names? Take a glance at our article on cool dog names. Our list of cute Bull Terrier names is packed with both names that have clear English origins and other common, popular cute dog names. While our previous cool names list focused on the Bull Terrier’s physical traits, here we take a more lighthearted approach. Many of these names are tied to the Bull Terrier’s playful (even mischievous) nature. This approach results in a host of funny names for Bull Terriers. Most of these also lend themselves to good Bull Terrier puppy names as well as Miniature Bull Terrier names. Clearly, these cute Bull Terrier names have many potential uses! If you’re interested in more cute dog names, check out our article on cute dog names. With this final list, we’ve put down unique and unusual names for Bull Terriers that don’t fit neatly into the category of “cool” or “cute,” but deserve your consideration anyway. Many of these potential Bull Terrier names have clear meanings that make a statement, such as names related to social status and power. This is a tribute to the Bull Terrier’s previously mentioned time as a dog for nineteenth-century British gentlemen. We’ve also included some unisex names of English origin that we think have their own unique appeal. Interested in even more unique dog names? Take a look at our article on unique dog names. With all of our Bull Terrier names, we hope you’ve found a name that fits with your new pup. As we’ve seen, Bull Terriers are a unique breed that have many characteristics perfect for naming inspiration. We wish you and your playful, intelligent Bull Terrier all the best!